I just heard the above description tonight while listening to a live radio broadcast from New York City. Hurricane Sandy had been projected to be “The Perfect Storm,” but the above description is that much more accurate. In August of 2011, Hurricane Irene was also projected to be a really bad storm but according to many people in the region, it failed to materialize into the monster tempest many weather experts had predicted it to be. This is very curious in light of the fact that Irene did billions of dollars in damage and cost many lives. Another possible coincidence is in the works. The first major Atlantic hurricane is presently rebuilding strength in the Caribbean. It is projected to grow to a Category 4 storm and lessen to a 3 as it strikes the Carolinas, then move directly over Washington D.C. late Saturday night, August 27. On Sunday night it is currently projected to strike New York City as a Category 1. The last time that happened was in 1821. The Norfolk and Long Island hurricane was only the second hurricane to have ever passed directly over New York City. The 1821 storm happened exactly 38 years since the Treaty of Paris, slamming into Long Island on September 3 of that year. 38 is a multiple of 19. The hurricane just happened to have a 13 foot storm surge. Coincidence? Though predicted otherwise, Hurricane Irene did not achieve such a high storm surge last year, but guess what? Hurricane Sandy has officially brought a thirteen foot storm surge. What Irene did not do Sandy has done. Regarding judgment then, it is now very clear that Irene, as bad as it was, was a mere warning of what would come later. In light of the fact that pretty much every American paying attention knows we have major problems in both our national government and religious life, the minor damage done in the quake to these two structures must at least be considered as beyond mere coincidence, and a possible wake-up call. In the meantime, the latest track estimates have Hurricane Irene heading directly for New York City, though the storm is expected to veer a tad to the east. America in general may continue disregarding and rejecting God, but God’s people are pleading for His involvement and mercy. A few fissures in our national monument and several fallen doodads off the national cathedral might seem minor at first glance. Do they represent national schism and crumbling traditional Christianity? Whatever the case, such coincidences sure seem to be piling up. And now Irene is here. Time for a showdown, Lieutenant Dan? As of this writing on Monday night, October 29, 2012, millions of people are without power in the overall region affected by Sandy, which is currently being labeled a “Post Tropical Storm.” Dire warnings had already gone forth from New Jersey, New York, and Connecticut governors. Connecticut was hit very hard by Irene and looks to be hit even harder this time. Almost all transportation is currently cut off in New York City. Bridges and transportation tunnels are closed. Major flooding is taking place. The Battery Tunnel took on fifteen feet of water. All subways are currently flooded with at least five feet of water. New York utilities run underground and much power was already turned off before the surge arrived for security purposes. Such flooding was predicted last year with Irene but never materialized. It is materializing now. As of this writing, we will not know how bad this will be, but it will obviously be the worst storm in recorded history in the area. No storm with this much energy has ever ventured this far north. Sandy is an even greater storm than the precedent-setting storm of 1938. And as I mentioned before, the last time there was a thirteen feet storm surge in New York City was 1821. The Sandy storm surge reached an incredible 13.88 feet! Though many people were killed, almost five million lost power, huge regions were flooded and flooding is ongoing, and billions of dollars in damage took place, some curiously bitter people continue to insist that Hurricane Irene was a hyped event. Some are very thankful that the huge storm was not as bad as originally predicted. Some are arrogantly putting forth their opinion that the storm was nothing that couldn’t be handled, and that they handled it quite well. Again, it is now apparent that Irene was a warning. As a result, many people had become complacent and prideful and have not taken Hurricane Sandy seriously. A million people in the New York area are without power, the city that never sleeps is in darkness, and the Big Apple is underwater. Are people in the area taking Sandy seriously now? There has been a flooding “incident” at a nuclear power plant in New Jersey. Cell phones are not working. All of this is taking place in darkness and the full extent will not be known until the daylight hours of Tuesday morning. This was a clear prediction that something worse was on the way. That “something worse” is happening right now. 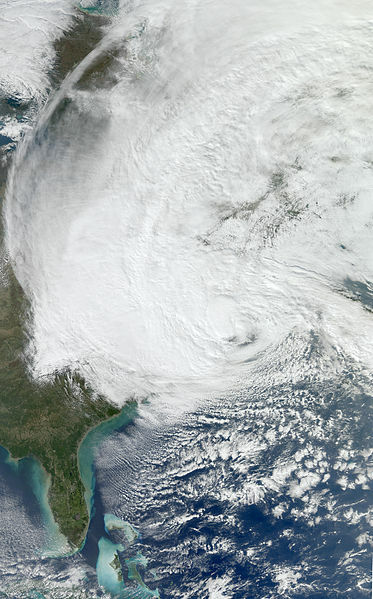 Again, Hurricane Sandy is the biggest, baddest, greatest storm to ever hit New York City. They are calling this a “Katrina-like disaster.” The normal high tides are also being affected by a full moon. Some will still insist that all of this is mere coincidence. THIS IS NOT COINCIDENCE. THIS IS JUDGMENT. For all those who do not believe in this kind of judgment, you have greater judgment to look forward to in the future. Yet even in the midst of this, real Christians continue to pray for this country and the good news is that the Lord Jesus is hearing our prayers and responding. We are in the early stages of the greatest national Great Awakening this country has ever seen and nothing will stop it from coming to pass. Non-Christians and unreal Christians will hate this event and fight against it just as they hate the Lord and fight against Him. But for the sake of His people, God is doing everything He can to save and restore what can be saved and restored of this country. Judgment is a greater degree of warning. It is designed as a last step effort to wake people up. Many are being awakened, but many others continue to insist on the opposite. This explains why Irene was a “Lesser Hurricane,” and why Sandy is the most “Super Perfect Wicked Storm” in the New York area in American history. Over the next few days we will all see just how wicked. Perhaps it may even approach the wickedness of many people in America who continue to sin to their heart’s content with no remorse and no cure, except that of national repentance and a return to the Savior of mankind. Posted on October 29, 2012, in Current Events and tagged Connecticut, Hurricane Irene, Hurricane Sandy, Judgment, Lord Jesus, New Jersey, New York City, Real Christianity, The Great Awakening. Bookmark the permalink. 8 Comments. And many will take heed… but unfortunately, many will ignore the warning and they will go on as the harlot serving their false gods… until it is too late. 2 Chronicles 7:14: “If My people who are called by My name will humble themselves, and pray and seek My face, and turn from their wicked ways, then I will hear from heaven, and will forgive their sin and heal their land.” —God’s call to the world… but is the world ready? Thank you, Lyn. Let us all pray for America. Yesterday was the 29th day of the 10th month. Psalm 29:10 reads: “The Lord sitteth upon the flood; yea, the Lord is King forever.” Coincidence? I don’t think so! God is trying to wake up America! By the way, it is interesting that HMS Bounty that I visited and wrote about in my blog sank in this storm and the woman who perished was named Christian! Amazing. Be Blessed, Tom. Thanks, Tom. And of course the Bounty was all about mutiny, or rebellion. On the Hebrew calendar, Sandy arrived just before sunset (coincidence?) at the end of Cheshvan 13. 13 is the Biblical number of rebellion. The experts are saying what this storm did was unprecedented. It did not behave the way hurricanes in that area always do, which is to veer northeast. Sandy took a hard left. Unbelievers will strain themselves trying to explain all this and will claim coincidence, or the vagaries of Mother Nature, or use technical jargon. I noticed in all of the media reports I witnessed, nothing at all was said about God or seeking His help. It was all about how humanity would rise above this and rebuild. Yet without the Lord Jesus, there will come a time when there will be nothing left to rebuild. Rejecting God means accepting the devil. That’s just the way it is. There is no middle ground. How else can rebellion be dealt with while still wanting to preserve the good? My computer has been out of commission and under repair at the manufacturers shop, so I just read your two articles on the two storms. Many of us got the Jersey and NYC connection. Unfortunately believers also had to go through the storm and the havoc it left behind. It’s time for the Church to not only pray, but to also minister to those affected by this judgement of God. Often a helping hand results in opportunity to share about the love of the Lord to those who are receiving the help but don’t yet know our Father. Thank you, Marcy. I know you guys have first hand experience with both Irene and Sandy. It is truly a great opportunity to minister to those who have been hurt and even devastated by this storm. Without such a wake up call sinners often continue on toward hell with no cure. You are exactly right that the Church must not only attempt to help people remove the blinders but also show one another mercy and love. Amen. Back in September of 2012, Jackson, Wyoming had a major forest fire. I believe it was a warning on a wicked town. Jackson is a very liberal town and has an abortion clinic. I had some friends protest outside an abortion clinic in Jackson and they said they received more hate speech in Jackson than in any other place in the United States. I believe there could be a worse disaster coming to Jackson in the near future.